Rowen Schussheim-Anderson has been pushing the boundaries of traditional tapestry weaving for over two decades. 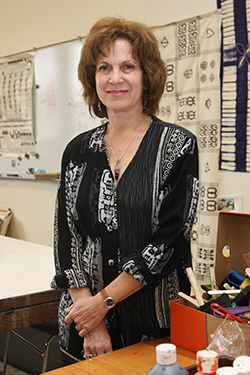 Her studies in New York and Arizona put her in touch with both time-honored fine arts and indigenous craft traditions. Cloth in our culture does not bear historical or religious significance, as with many indigenous peoples; nor do we often recognize the power of textiles as clothing for the body and soul. Schussheim-Anderson’s tapestries explore the power of textiles as bearers of meaning—thick, embellished warps tangled and rich enough to hold the meaning and power of messages.